Whether you wear them as a camp shoe at the end of the day, or put ’em on to cross a stream so your boots don’t wet, or actually tackle your entire hike in them… sandals are practically required footwear for hikers. In fact, sandals are mankind’s oldest, and probably favorite footwear. And with new designs and technology, you can do more in a pair than you ever thought possible. This sandal buyers guide will help you find the right product for the combo of your feet and your favorite trails. The feeling you get when hiking in a sandal can be way more fun and comfortable than in a shoe or boot. Usually, sandals are lighter (though not always, as you’ll see below). Without something covering your whole foot, the airy feeling can not only keep your feet cool, but let’s you connect to the world around you. Most sandals are water-friendly (again, see below), so you can handle a trail or a stream without worrying, or without taking off your padded hikers so they don’t get wet. They’re easier to slip on and off. Some people keep sandals handy for when they’re done with a hike, to use as a camp shoe at the end of the day. That’s fine. In that case, you may want to go with something lighter and easier to pack. Some people keep a pair handy for those stream crossings I mentioned above. Again, the point is that a hiking sandal is an incredibly versatile piece of gear, so you want to get the pair that works for your needs. How do these compare to boots or shoes? They were aghast that I didn’t have a big, thick, chunky pair of boots to wear. Well, suffice it to say I was completely fine. I had no problems going up a 14,000-foot mountain except for the fact that once you get over about 12,000 feet, every two steps you take you need to take a break. But in terms of the biomechanics and how my legs felt and how my feet moved and the grip that I had and the traction that I had, everything was totally fine. The reason that most people say you need boots is because of the ankle support. Well, the only reason you need ankle support is because the boots have a really stiff sole. So if you step on something pointy with a really stiff sole, it’s going to make your entire foot rotate, it’s going to make your ankle unstable… and then you need stability because of the fact that the boot sole is so stiff that it made you unstable to begin with. In a pair of running shoes, I didn’t have that same instability issue. The sole was more flexible and my ankles had no problem. Fast-forward to 2016, which it is right now when I’m making this video, and what I can tell you is if you want to have even more fun, you can go hiking in a pair of sandals. Some people think that you can only use sandals for flat surfaces or easy surfaces or for boating or for paddling, but I can assure you that you can go hiking in a pair of sandals. We have thousands of people who have climbed tens of thousands of mountains in Xero Shoes, for example. One of the things that you get when you’re hiking in sandals that you don’t get in shoes or in boots is freedom. Your feet are free to feel everything around you. You have this incredible sense of connecting with the world because your feet aren’t all wrapped up in a pair of shoes or boots. The other advantage this gives you is that you don’t get all sweaty inside of your boots or inside of your shoes, which can be a real problem if you’re hiking in cold weather. That sweat can freeze and make your feet frostbite. And in hot weather, that sweat just builds up and creates, well, aside from bacteria and odor, it also makes your feet slippery which can lead to blisters, skin peeling, toenails that fall off… it can be horrible. So I can assure you that sandals are a great choice. In fact, with Xero Shoes it’s an even better choice I think because the sole is so flexible. You get natural, barefoot-inspired movement. 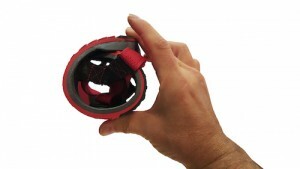 Your foot can grip and bend and flex, so you’re using your foot in addition to the highly grippy sole that Xeros have. We have thousands of FOXes (Friends of Xero) who’ve climbed tens of thousands of mountains with no problem — including a lot of the 14,000-foot mountains in Colorado — in a pair of Xero Shoes. So, what are the top three hiking or travel sandals? I’m going to rely on a review that was recently done by ActiveJunky.com to tell you that. They took a collection of sandals out on a bunch of trips. They went to South America, they went to Central America, and they came back with three products that they reviewed. I’m going to tell you a little secret: Most of the time when they review products, it’s products that they have an affiliate relationship with. That means that when they review a product and people click on a link from their review to purchase the product, they get a commission. That’s their business model. Well, they listed three products, two of which they get commissions from and one they listed just because, they said, they like it so much that they wanted to include it in the review. It needed to be there, but they don’t get a commission on it. 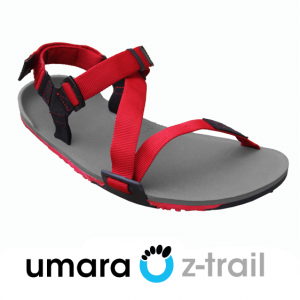 I will not spoil any surprise by telling you that that product is the Umara Z-Trail from Xero Shoes. They recommended two other products. One was the Chaco Z-Cloud which is, again, one of those big, thick products with prices between $95 and $105 typically. Then there’s a Keen product, the Keen Zambezi, which again, a really thick and stiff and heavy sandal that retails from $92 to $100. The Z-Trail from Xero Shoes, on the other hand, only $79.99, and it’s the only one that’s really lightweight; that gives you great protection, great flexibility, natural movement flexibility, really good comfort; lightweight enough to float. Rolls up, fits in your pack, in your pocket, and has our 5000-mile sole warranty. Get the Men’s Z-Trail here. Get the Women’s Z-Trail here. Who makes the best hiking sandals? If you’re looking for the best sports sandal or hiking sandal, you’ve got to think about the history of this type of sandal. 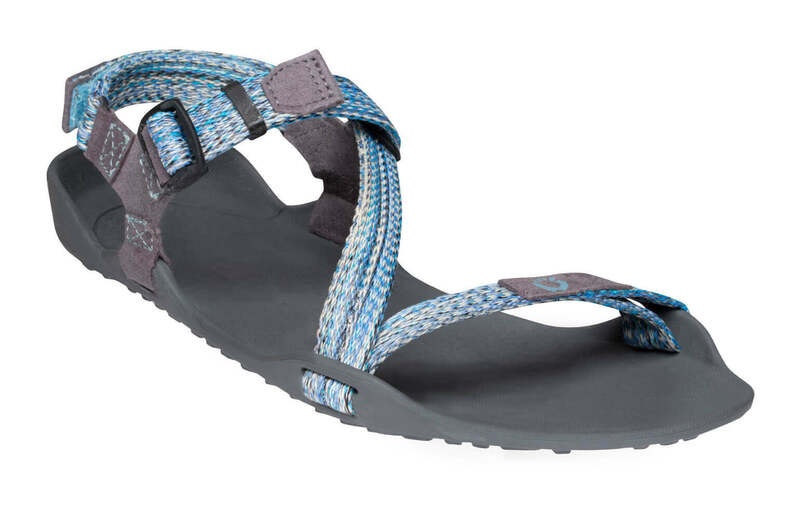 It was 1982 when Teva was invented and 1989 when was Chaco was invented, and in the 25-30 years since those two things happened, those products have become synonymous with the hiking sandal. And so when most people think of hiking sandals, they’re thinking of those. And those sandals are big, they’re thick, they’re chunky. It almost seems like people now look at hiking sandals and trying to value them by the pound. The heavier, the bigger they are, the better they are. That’s not necessarily the case. While these do give you a lot of protection because there’s a lot of thickness, thickness isn’t required for protection. The other thing people have gotten used to is the notion of arch support. Both of these products, and most of the other sandal makers— Keen, ECCO, and private label brands from North Face and various other places—they have a lot of arch support. Now, here’s a reference to an article in the New York Times about support. I’ll talk about this more later but, in short, support is highly overrated and the research shows that it’s predominantly unnecessary. And if you think about it, the reason is pretty simple. Your foot is designed to move, to bend, to flex, to feel, and when you’re giving it “support,” what you’re doing is you’re immobilizing it. Think about it this way: If you put your arm in a cast, it doesn’t come out stronger at the end of the day. Or, if you take off the cast and you see that it’s gotten weaker, you now have two choices – continue to “support” it so that you’re not using it or start using it again so that you strengthen it. So a lot of sandals are made with support that really isn’t necessary. The reason that they put in the support is because the sandals tend to be inflexible, and if they’re inflexible, your foot can’t move properly anyway and the extra support makes it a little more comfortable. But if you have a product that’s designed to let your foot move naturally, then you don’t need support. Your arch is all the support that you need. In fact, as you use your foot, you can strengthen your foot, strengthen your arches. 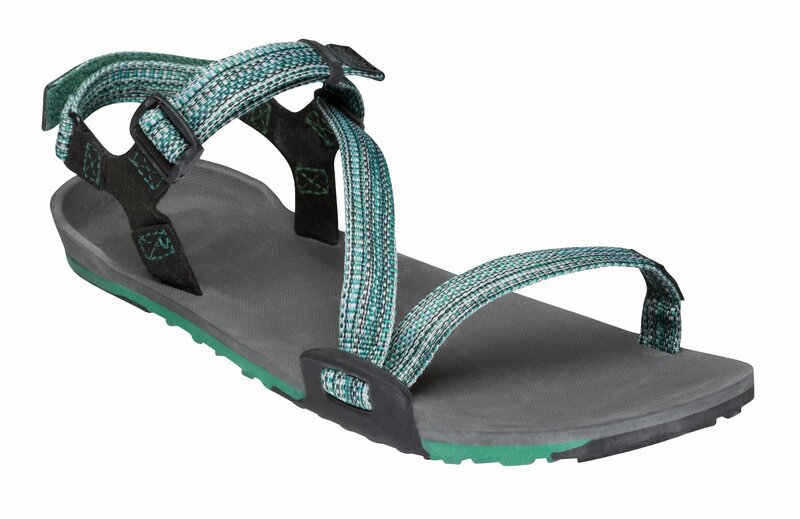 If you look at the Xero Shoes Z-Trail, it has a similar appearance to the Chaco/Teva/Keen that you’ve seen except that it’s much, much thinner. We’re using some high-tech materials to allow us to make something that weighs 76% less. Three pairs of Z-Trails weigh less than one pair of a popular Chaco (see the video below), and yet it still gives you incredible protection. On the bottom, we use FeelTrue rubber on the abrasion points, and it has our 5000-mile sole warranty. For the middle layer, we’ve developed a high-tech material that disperses the force. We call this TrailFoam. And then we developed a comfort layer that we call BareFoam for the top surface. Put these together and you have an ultra lightweight sandal that gives you an incredible combination of protection, comfort, lightweight, durability, versatility, and affordability. They even float. They roll up and fit in your pack or pocket. That flexibility is what lets your foot move naturally. People wear the Z-Trail for everything from taking a walk to being an approach shoe for a climb, taking a casual hike, running trail ultra marathons, and everything in between. When looking at sandals, pay attention to the webbing. A lot of sport sandals use a flat webbing, which means that it gives you an edge that can actually dig into your skin. What we’ve done instead with the Z-Trail and Z-Trek is used a tubular webbing. So there are really no edges that can catch on your skin. Another thing to look at with some of hiking sandals: they’re made with channels in the inside of the sandal for the webbing to pass through. Sometimes those channels can create abrasion, which causes tearing in the webbing. Something to pay attention to. Also, look for adjustability. Many sport sandals don’t have any adjustability on the heel. So, depending on the size and width of your heel the fit may not be correct for you. The Xero Shoes Z-Trail has an adjustable heel strap and adjusts along the top as well for a just-right fit. Hopefully, that’ll give you a good list of things to take a look at when you’re looking for best hiking sandal. Again, look for comfort, look for natural movement, look for something that isn’t going to hinder you or get in your way (which means something that weighs a pound and a half might not be right for you; something that weighs 5.4 ounces for men’s size 9 might be just right). If you’re going to be in water, you need something that floats. The Z-Trail is really, really secure on your foot, so they’re not going to fall off and go floating downstream. But just in case you have them in your bag or you have them just sitting in a boat and the boat capsizes, you want to make sure you’re going to be able to easily find your sandals and not have to go hunting for them in scuba gear on the bottom of a river or a lake. Anyway, hope that helps you find the best pair of hiking sandals. If you have any questions, you can just leave them here and I’m happy to answer. How do Xero Shoes Compare with Other Hiking Sandal Brands? First check out this video where I compare the weight of the Z-Trail to a popular sport sandal. What you’ll find, not surprisingly, is that unlike every other sandal product or every other hiking sandal, which has a big, thick, stiff sole that weighs a lot and costs quite a bit, the Xero Shoes Z-Trail is lighter, takes up less room, lets you have natural movement and flexibility, gives you just enough ground feel so that your feet are actually working properly, and lower-priced as well for something that has the same level of performance. Speaking of price, keep in mind that Xero Shoes come with an unmatched 5,000 mile warranty. How should sandals for hiking fit? When you put on a good pair of hiking sandals, you shouldn’t have your toes way, way back behind the front edge, or way over the front, or way off on one edge. Your foot should actually fit on the sandal and it should be a comfortable fit fore and aft, and left and right. We make sandals with different widths and different lengths to accommodate most foot sizes and shapes. And our do-it-yourself sandal-making kit let’s you trim the sole cut to match any shape of almost any foot. When you put on the sandal you want to go for what I refer to as a snug-but-comfortable feel. Many people try to over-tighten around the toe area. They think that’s the thing that’s holding them into the sandal, but it’s actually the area that goes around your ankle that holds you in. So you want to go for something that feels comfortable and feels secure, but not that’s ratcheting you down to the sole. In fact, many people find that they end up loosening the area around the toe strap more than they expected, and that’s totally, totally fine. It still stays stable on the sandal because of how it holds across the top of their foot and around their ankle. There’s more fitting instructions in the videos on this page. Where can I buy hiking sandals? Buying hiking sandals is not hard anymore. It used to be when they first invented the idea of sandals for hiking. You could only find them in specialty outdoor stores. But now, they’ve become ubiquitous and you can find them pretty much everywhere. So if you look in, well, obviously the outdoor stores like REI or EMS, you can definitely find them there, but you can even find them at Target, at Walgreens. And of course, if you look on the websites for the companies that make these products, there’ll be a list of stores where you can find them. If you look in an outdoor store, a camping store, a hiking store—some running stores will carry sandals that are perfect for hiking as well. Where else? Fishing stores, some of those will carry sandals that are perfect for hiking because if they’re good for hiking they’ll also be good for fishing. Climbing stores — sandals make a great approach shoe. So even if you’re not going to climb in a pair of sandals, just to walk to where you’re going to be climbing or to leave where you just finished climbing, sandals are a great option for that as well. Where else? Department stores, depending on the department store, you can also find them there. Suffice it to say, hiking sandals have become very popular and you can find them pretty much everywhere. Start online, then call around to the local stores around you and I’m sure you’ll find what you need. Do you wear sandals with socks? This is a style question. If it’s cold you can just wear a good pair of wool socks sport sandals. If it’s warm, you can wear a synthetic that has wicking properties and is valuable in other ways. So, yes, can definitely wear socks with sandals, although people might look at you a little strangely, depending on what you wear. Personally, I have a collection of tie-dye socks that once I started going barefoot and wearing huarache-style sandals I almost never wore. But with the sport-sandal style, I pull them out every now and then and they look pretty fine. Let’s talk about arch support, which is a very misunderstood topic. What I can tell you is, whether you’re a man or woman, have flat feet or high arches, the issue really is the same, and that’s about the strength and flexibility of your foot, not the support in your shoe. If you look at the reviews on our Xero Shoes website, you’ll see hundreds of people reporting that when they got out of their supportive shoes, that’s when they were fine. That’s when they felt stable. That’s when they got strong. That’s when they were getting rid of various pains because they’re using their feet naturally. A quarter of the bones and joints in your body are in your feet, and that’s not an accident. Your feet are designed to bend, to flex, to feel the world. If you don’t let them do their job naturally, that function, that flexing and bending and balancing function, tries to move up into the ankle, into the knee, into the hip, into your back. But those joints are not made for that purpose. They don’t have that same fine motor skill possibility. So when you immobilize your foot, you’re forcing those other joints to try to do a job that’s not theirs. That can cause problems. Similarly, you have more nerve endings on the bottom of your feet than anywhere but your fingertips and your lips, and this is not an accident. Your feet are supposed to feel things when they’re moving. They’re supposed to feel the surface underneath them. Support is like putting your foot in a cast and expecting it to somehow get stronger. Doesn’t work. If you break something and put it in a cast, it comes out weaker. Then you have two options—there are only two—one is start to use that body part again so it gets stronger; the other is keep supporting it because you’ve made it weaker. That’s what many people are doing when they immobilize their feet with arch support. I’m going to highly recommend that you start experimenting with letting your foot work naturally and strengthen naturally. There’s a great New York Times science reporter named Gina Kolata who did a piece of research that talks about how support seems to only be helpful for about 10% of a population and no one knows why, and a $500 custom-made orthotic seems no better—or worse—than a $20 Dr. Scholl’s insert that you can get at Walmart or Target or Kmart or wherever you find one of those things. Check out Gina’s article (and my comments about it) here. The research shows that orthotics and arch support and shoe inserts are not as valuable as people think. They make a lot of money for doctors though. And with shoes that have support, it’s basically just having an insole or an orthotic in there full-time. So, again, I’m going to encourage you to start using your feet naturally. (Now, if you have some real serious biomechanical problem, that’s a whole different story, obviously. Consult a doctor… ideally one who understands the value of natural movement). What if I have flat feet? Flat feet are not the problem people like to think they are. There’s no strong evidence to back up the idea that flat feet need support. The real issue isn’t about whether your feet are flat or whether you have high arches. It’s about whether your arches are strong, whether you’re using them so they become strong and resilient and flexible. People with high arches sometimes need to work on flexibility. Flatfooted people often just need to work on strengthening. And the best way to strengthen your feet is to be barefoot or in something like Xero Shoes, which are incredibly, incredibly flexible and give you all the fun and benefits of barefoot, but with a layer of protection and comfort. The gist is that you need to be moving your feet, to use your feet, which can strengthen your arch. The other issue is sometimes people will tell you you have a problem simply because you have flat feet, when they don’t really understand the biomechanics of it. Maybe you’ve got a problem not because your feet are flat but because you’re wearing some big, thick, stiff hiking boot or hiking sandal that doesn’t let your foot move, and so your ankle, your knee and your hip are trying to do the function that your foot would do if you let it move naturally. Anyway, all that said, once again, try the natural approach. Don’t worry about whether you have flat feet. Just develop some strength and resilience, and let me know what happens. Take a look at this article, too, about flat feet and high arches. What if I have wide feet? If you have wide feet, I have good news for you. Xero Shoes are designed to work for the way human feet are shaped. They’re designed based on the shape of feet. A foot doesn’t get pointy near the toes, which what most shoes are designed to do. Xero Shoes let your toes spread and to splay and to move naturally. They are designed wide enough to allow you to do that. If you’re a woman with particularly wide feet, you might want to look at the “men’s” version of our sandals because the men’s versions are just made a little wider. Conversely, if you have narrow feet, especially if you’re a man, you might want to look at the women’s style, which basically is the same thing but just a little bit narrower. So don’t worry about wide feet. We’ve been able to accommodate that. Now, if you have incredibly wide feet — and we have seen some surprisingly unusual-shape feet in the years that we’ve been selling sandles — you can get one of our do-it-yourself sandal-making kits. The soles in our kits come different sizes and lengths and widths, and they’re designed so that you can trim them to give yourself a perfect fit for whatever foot shape that you have. How do you make hiking sandals? For Xero Shoes, we have a relatively high-tech manufacturing process, especially for our Z-Trail sandals, which have a three-layer FeelLite sole. The high-tech materials let us make something ultra-ultra-lightweight, incredibly, incredibly flexible so it lets you have natural foot movement, but is still really protective, really durable, really comfortable. We bond three layers together. Our FeelTrue rubber is on the bottom surface for great grip and traction and durability. The middle layer we call TrailFoam, and that’s what evens out the bumps. It’s a force dispersion layer. And our top layer we call BareFoam. It has just a tiny amount of padding built into it that you would be surprised – it doesn’t seem like much when you feel it with your fingers, but when you put it on your foot, your foot reads that as, “Wow! That’s a lot of comfort and protection.” It also has this heel cup on the back to help keep your foot stable and centered, and also help keep debris out. We use tubular webbing and laces, so there are no edges that to dig into your skin. Then, we’ve developed exclusive hardware that lets you adjust the tension really, really quickly and easily and securely. Finally we have an adjustable heel strap so you can move your foot forward and backward and get just the perfect fit. How do they do in water or when wet? First of all, think about the comparison between hiking sandals and, say, hiking boots or trail-running shoes or shoes that you would wear for going on a hike. If you’re in boots or shoes and you get those things wet, it’s going to take forever for them to dry out. In fact, it can really, really damage your feet because when your feet are wet and they’re enclosed in something wet, you can get blisters and massive abrasion. If your feet stay wet long enough, your skin can start to slough off. I mean, it’s really, really horrible. So sandals give you the great advantage that you get in and out of the water and your feet dry off almost instantly. So that’s great news. 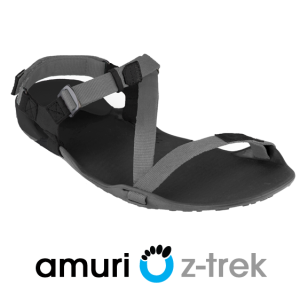 We’ve made our Z-Trek and Z-Trail sandals with a nice grippy surface so that you get great traction. Now, there’s nothing that can prevent you from sliding in all situations. In fact, that’s sort of a fantasy people have, is they will have something that sticks in mud and sticks on ice and sticks on everything, but that’s just not reality. Frankly, the thing that keeps you stable — more than the surface of the shoe — is paying attention to your gait, paying attention to how you move your feet. If you’re placing your foot underneath your center of mass, underneath your body rather than reaching way out in front of your body to grab the ground and then pull towards you, you’re in a more stable position to begin with and you’re going to have less issue with sliding around at all. Xero Shoes customers include kayakers, paddleboarders, people who raft down rivers, fly fishermen—if you look on our website, you’ll see reviews from all of these people—who are loving the Z-Trek and the Z-Trail. 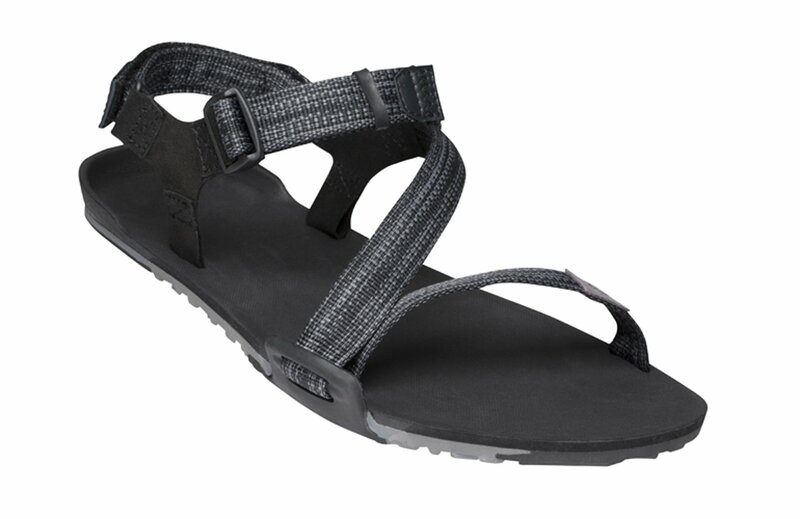 The sport-sandal-style webbing is more secure compared to our huarache-style webbing. FOXes (Friends of Xero) are handling all sorts of terrain, wet and dry, without a problem in our Z-Trek and Z-Trail. 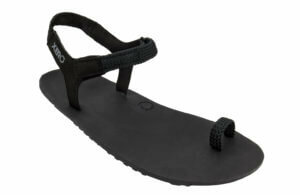 Oh, one other thing about dealing with the water: If you compare the Xero Shoes especially the Z-Trail to, say, one of the familiar sport sandals from other companies like Chaco or Teva or Keen, the Z-Trail floats. If you’re not necessarily wearing the shoes but you have them just lying in a boat or sitting in a pack, you want to make sure they don’t sink to the bottom of whatever kind of water you’re in – river, lake, stream. They’ll just happily float which comes in really, really handy sometimes. Are these safe for toddlers? Are hiking sandals or Xero Shoes safe for toddlers? The answer is both yes and no-ish. The Yes is based on looking at how toddlers walk and run. They’re using their feet naturally. They run with amazingly perfect form almost all the time, until you start putting them in shoes. So to let them continue to use their feet naturally, to get that same barefoot experience but with a layer of protection and comfort, is a wonderful thing and I highly recommend it. The no-ish part is we’re currently not making sandals for toddlers. We’re not making our Z-Trail hiking sandal, for example, in a toddler size. What thousands have done, though, is get our do-it-yourself sandal-making kits and then lacing them up so they work well for toddlers. One thing about toddlers, they do tend to put a lot of friction on the bottom surface of a sandal, so if you’re going to make one of our do-it-yourself huarache kits, you’re going to want to use some flexible epoxy or what we sell as Shoe Goo and put that on the laces on the abrasion points on the bottom of the sandal and in the point just above the top of the sandal — the places where kids are going to generate a bunch of friction. That way, the laces will last longer. Are these for sale in the Philippines, Hawaii, or Costa Rica? Yes and no. As I mentioned in a previous video and in the article or above where we are now in the article, if you go to outdoor stores or running stores or climbing stores or even just department stores, you’ll find them. Check our list of stores to see if there’s somewhere near you, or just order online here. By the way, Hawaii has a great sandal culture, but they mostly wear flip-flops. And flip-flops are not good for hiking. You have to grip with your toes to hold them on you, to jam your foot in the thong, to hold them on your foot. They’re usually made of materials that are either too stiff or too heavy, or the exact opposite – too light and too flexible, that usually, not very durable. If you look at people who’ve worn flip-flops for a while, you’ll see that they’re often falling off one edge or the other because the foam has compressed in a way that’s now leading their foot to fall off one side, which makes their ankle out of whack, their knee out of whack, hips out of whack, back out of whack. So I don’t recommend flip-flops. We’ve gotten lots and lots of response from people wearing Xero Shoes who have taken these on hikes around the volcanoes in Hawaii. Our FeelTrue and FeelLite soles handle those volcano hikes wonderfully. Shop around and you’ll be able to find what you need and enjoy hiking, paddling, walking, strolling, hanging on a beach and anything else when you’re in places like Hawaii, Costa Rica, Philippines, Singapore. Which Xero Shoe is the best type of hiking sandal? This is not a simple question because people use all of our products for everything from taking a walk to going shopping, to hanging out in an urban jungle like New York City, to climbing mountain trails, to running a 256K race across Madagascar over dirt and mud and streams and rocks and everything in between. How much protection do you want versus how much of a barefoot feel do you want? We have products on both ends of that spectrum. Our 4mm Connect do-it-yourself kit is the closest thing you’ll get to barefoot. In our ready-to-wear products, the Cloud for Men or Women is super lightweight and just like being barefoot, but with a layer of protection and comfort. The huarache style, in a way, feels like you have nothing on your foot. It feels the most like barefoot, the most free, because you’ve just got this little bit of lace that’s holding it on your foot. Now, some people think that’s not secure. I can assure you that it is. 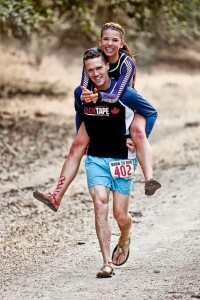 We have lots of customers who’ve run ultra marathons in the huarache style. This sandal-tying style, the basics of it, is over 5000 years old and works surprisingly well. It’s all you need to hold a sole onto your foot, is that little sort of three-point lacing system just like that. The sport-sandal style, on the other hand, feels like someone has just replaced the sole of your foot with a tire tread. Because of the webbing, it has more surface area, so it feels more secure but you also feel more. There are good reasons to go for the most minimalist shoe you can get away with. You have more nerve endings on the bottom of your feet than anywhere but your fingers and your lips, and that’s not an accident. Your feet are designed to feel what’s underneath you. That helps for balance and agility, and also just knowing if you just stepped on something good or bad, dangerous or safe. And so if you want a real serious barefoot feel, again, you’ll find that with our 4mm Connect make your own huarache sandal kits. The kit is just a 4-millimeter FeelTrue® rubber outsole with lacing. You can actually lace them up in one of hundreds of different styles; making something ultra-ultra-minimalist or really night-on-the-town fashion-forward. You get a just-like-barefoot feel with a layer of protection. Some people want more protection than that and one option is still in our do-it-yourself kit: the 6mm Contact sole. The 6mm version gives you more protection but still great ground feel. If you don’t want to make your own sandals and still want a huarache style, take a look at our 5.5-millimeter ready-to-wear product we call the Genesis. The Genesis has our FeelTrue sole with our patented huarache-style lacing system. So that’s going to give you slightly more protection but still obviously really, really flexible, great ground feel. If you want something a little more comfortable and not necessarily as trail-friendly, then we look at the Cloud. The Cloud is actually just like the Venture except we’ve taken 3 millimeters out of the forefoot, just kind of dug a little trench, and replaced that with our BareFoam™ that gives you this tiny bit of cushioning. So it feels exceptionally comfortable and is ridiculously lightweight. So if you want to use this just as a camp shoe, the end of a day after you pull off your hiking-boot Xero Shoes and you just need something to get around the campsite, this is a great product. By the way, it also floats. So, really, really, comfortable, not quite as trail-friendly as the Venture. Maybe the ultimate camp shoe is our new Jessie sandal for women.
. Super lightweight, super comfy, and it even looks good after you finish your hike and head out on the town with friends. Then, if we get into the sport sandals, check out our Z-Trek. The Z-Trek and the Genesis have same sole – 5-1/2 to 6 millimeters of our FeelTrue rubber, just this one was with the sport-sandal style. I like to say that when you’re wearing the Z-Trek, again, it feels like someone’s just replaced the sole of your foot with a tire tread. Really great natural movement; really, really flexible; really, really comfortable. Again, a great camp sandal because it takes up very little room. A men’s size 9, weighs about 6.4 ounces. And for some people, they say, “Well, that’s heavy for a camp shoe.” But when you consider everything you can do in it compared to the really lightweight stuff and how little room it takes up, I mean it packs and rolls flat, then the value is a whole different story. Our newest product, the Z-Trail. The Z-Trail uses our triple-layer FeelLite™ sole. This weighs 20% less than our Z-Trek because we’ve made this with a high-tech foam that we’ve specially developed to provide really great comfort, great durability, great force dispersion, great traction, great protection. It’s an incredible combination of features. 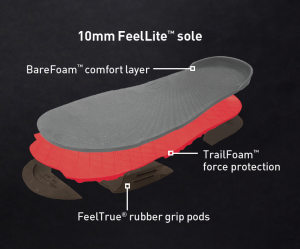 It has our FeelTrue rubber on the abrasion points, on the bottom; it has our TrailFoam in the middle for force dispersion; and our BareFoam, which gives you just the tiniest bit of cushioning. A men’s size 9 in the Z-Trail weighs only 5.4 ounces. 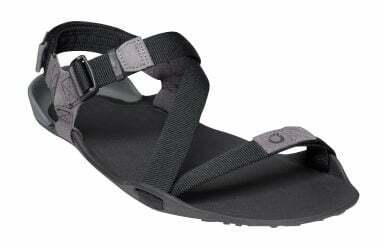 In fact, three pairs of the Z-Trail weigh less than one pair of this familiar hiking sandal. So, for people who want more protection, less barefoot feel, I highly recommend the Z-Trail. In fact, if you look at the reviews on our website, you’ll see the people who have tried all of our products just raving about the Z-Trail because of the level of comfort, the level of protection, but still flexible enough to give you great natural movement as well, let your foot really bend and flex. We have one customer in fact, he’s a hundred-mile trail ultramarathoner and for him the Z-Trek is just not enough protection. The Z-Trail, that FeelLite sole, gives him all the protection that he needs. So hopefully that gives you some advice on what Xero Shoes you’d like to wear. And if you have any questions, obviously, just a drop us a line. We’re happy to help. We just want to see you getting out there and Feeling the Freedom, Feeling the Fun, and Feeling the World with Xero Shoes. How do you wear a pair of Xero Shoes? Slide ’em on and #FeelRealFun. Actually, check out this page for instructions on adjusting your Xero Shoes for a proper fit. More important than how you wear them, it’s where you wear them. And the answer for that is, anywhere you can think of. Just enjoy. We have people who are doing everything from walking and running to skydiving, Crossfit, kayaking, paddling, standup paddle boarding, even yoga. 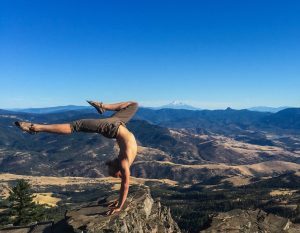 some people refer to these as a portable yoga mat that everywhere you go you have a yoga mat right underneath your feet, and there are some great videos of people doing yoga in Xero Shoes in these beautiful, beautiful natural environments. I hope that’s helpful. I can’t wait to hear what you experience with your hikes and your travels, and I hope you decide to Live Life Feet First in Xero Shoes.